There was a thread sale at my local needlework shop, so I went looking for something extra nice to work my bluebirds with! The larger skeins are Caron Impressions (50% silk, 50% wool), and have a really lovely sheen while still fuzzier than floss. The small brown ones are Bella Lusso merino wool, which are lovely and so very soft. I think the colors and textures will make the birds spectacularly vibrant, even while surrounded by all those beautiful flowers and leaves. There’s more than enough for two little bluebirds, so I’ll be having fun with these for a while. 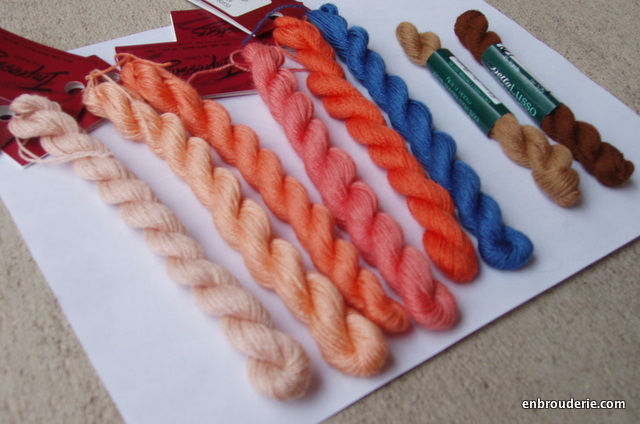 I was also extremely tempted by the absolutely gorgeous variegated wools, silks, and wool/silk blends from Gumnut Yarns. Those are beyond amazing. Unfortunately, since they’re imported all the way from Australia, the prices are also amazing. So they will have to wait until my salary goes up. Dear Australian readers, I am so very jealous of y’all. This entry was posted in Design sites, My work and tagged Bella Lusso, Caron Impressions, crewel, embroidery. Bookmark the permalink. You are so lucky to have a local needlework shop with such lovely stock. Mine just has DMC floss, soft cotton and perle. I went to Hobbycraft (a really big craft store) yesterday, and they have the Anchor range, icluding tapestry wool. If I want crewel wool, or silk, the staff just cannot help me at all . I presume that there just not enough customers who want to buy the items that interest me. The only time I get to see things like this is if I can get to a show! I feel that I am letting local shops down when I buy on the internet, but often it is the only way to get what I want. Gorgeous – looking forward to seeing what you do! Oh it is so beautiful!!!! What a wonderful opportunity to go to a needlecraft shop and buy what you need or want. I am from South Africa, living with my husband in Doha, Qatar. We found a thread shop in an ally with thousands of spools of machine thread and a small shopping basket size, mainly light blue and green, Anchor embroidery floss. Needless to say, I bought all the blues and greens and still I can not do any shading with it. surely there is a real thread shop somewhere over there! The colors you’ve chosen are scrumptious and the texture of the wools/silks should work really well with the birds! I like the colours you have chosen even if not the subject matter (I am ornithophobic). Gumnuts Yarns are gorgeous and lovely to work with – since I am in Australia and you are in America we may be able to do a swap of some kind. Let me know if you are interested. Well, we may have to do that at some point. To be honest, at the moment I’m rather swamped with work and will be for a few months. So the swap may have to wait til summer when I have time to figure out new projects instead of only kits. Thanks so much for the offer!